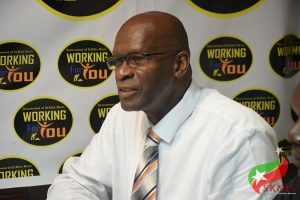 BASSETERRE, St. Kitts – On the Feb. 7 edition of “Working for You,” Permanent Secretary in the Ministry of Education William Vincent Hodge said that as a part of the Education Sector Plan (2017-2021), prospective teachers will soon have to undergo compulsory training to be certified and obtain a license prior to entering the teaching sector. “All of our teachers by 2021 should be trained and we should be at the point where we train you before you get into the classroom,” said Hodge as he explained that as a part of the Education Sector Plan, the ministry is seeking to professionalize the teaching force and keep with the Education Sector Plan’s goal for professional development. Hodge said that teacher training will be continuous after teachers have been certified to maintain certain educational standards and keep their professional license. “We are working toward better management of our schools,” said Hodge, while noting that training is a vital part of creating an environment in which students can excel. He said that it is important for teachers to embark on continuous professional development.